On Wednesday 23rd January, 2019 The National Insurance Board of Trinidad and Tobago (NIBTT) signed a historic Memorandum of Understanding (MoU) with the Ministry of Social Development and Family Services. “Creating synergistic ties between the two institutions will result in benefits to the citizens of Trinidad and Tobago”, so said the Executive Director of the NIBTT, Mrs. Niala Persad- Poliah, at the signing ceremony which was held at the organization’s Corporate Headquarters at Queen’s Park East, Port-of-Spain. The NIBTT, which operates a system of social insurance in keeping with the mandate of the National Insurance Act Ch 32:01, continually seeks to improve its customer service delivery to its beneficiaries. 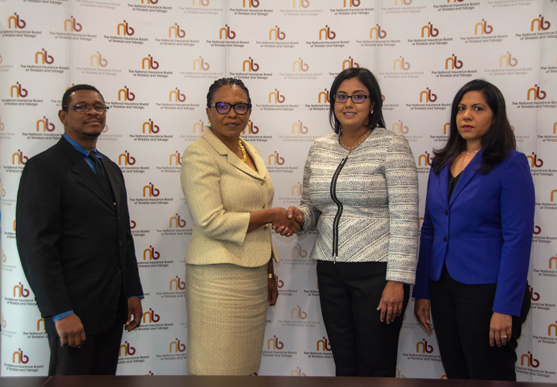 Mrs. Persad-Poliah stated that “through this strategic relationship, the Social Welfare Division and the NIBTT will liaise directly and communicate information on insured persons thereby eliminating the need for social welfare applicants to visit NIBTT’s offices to obtain information. Instead, the Social Welfare Division and the NIBTT will, by virtue of this MoU, communicate information directly on insured persons which will benefit both organizations in carrying out our respective mandates”. According to Permanent Secretary in the Ministry of Social Development and Family Services, Ms. Jacinta Bailey-Sobers, “on average, just about 25,000 persons come on board with various grants per year so those [persons] will initially benefit from this MoU arrangement with the NIBTT”. Since the NIBTT and the Ministry of Social Development and Family Services share thousands of customers, this collaboration will positively impact many lives. The MoU will also result in reduced customer traffic at NIBTT Service Centres and improved turnaround time for other NIBTT customers. It is expected that this initiative will take effect shortly and the public will be advised of the implementation date in a subsequent communication. Present for the MoU signing were several senior executives from the NIBTT and the Ministry.